Personalized Large Oval Home Identification Sign - - 10.5" x 18" large oval or 16.25" x 26.25" estate oval hold one or two lines of your custom text. Estate size plaque can be ordered with 8" characters. Made in USA. 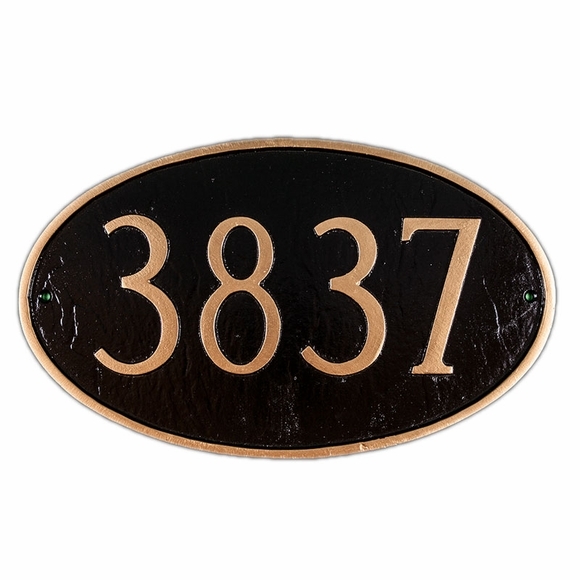 Oval address plaque custom made with your personalized text and color scheme selection. A one-line 10.5" x 18" sign holds up to five 4" characters. A two-line 10.5" x 18" sign holds up to five 4" characters on line 1 and up to 17 characters on line 2. Character count includes spaces. A one-line 16.25" x 26.25" sign holds up to five 8" characters. A two-line 16.25" x 26.25" sign holds up to five 5" characters on line 1 and up to 17 characters on line 2. Character count includes spaces. If ordering a one-line sign, please leave the Line 2 input box blank. It is not necessary to use both lines. Dimensions: 10.5"W x 18"H or 16.25"W x 26.25"H.
A one-line estate size 16.25" x 26.25" sign with 8" characters is a good choice when you want large, easy to read house numbers. Click top link in Related Products to see this sign in a smaller size.